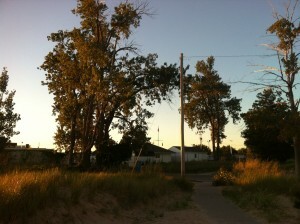 On Wednesday, June 27th, there were seven of us that met on the beach at Pere Marquette Park for a cookout. It was a great idea. 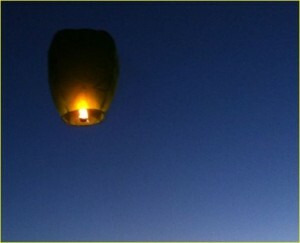 Afterwards, I decided it would be fun to launch some Sky Lanterns Peg had given me for Christmas. I first saw them in Thailand. They filled the night sky as they drifted leisurely out over the Andaman Sea. At times, you could see dozens of them. It was a magnificent sight. The Sky Lanterns Peg got me are very similar. They are like small hot air balloons. You light a fire in the bottom, and the balloon part fills with hot air, making it rise. Simple, right? Well, it turns out there is a bit more to it. It was windy on the beach, even by Lake Michigan standards, so we gathered to light the first one in the shelter of one of the dunes. I was the self-appointed torch man whose job was to get the fire started. There were 2-3 others who helped hold the lantern upright; the others were busy shouting out instructions and encouragement to the rest of us. The fire wasn’t too hard to start. The real problem was holding the lantern steady and upright so it could fill with the hot air. And, of course, the wind didn’t help. It swirled around us, trying to put the fire out. And then, when the fire was going well, the wind changed tactics and tried to rip the lantern out of our hands. But we didn’t let any of that happen, and slowly, the lantern filled with hot air. Eventually, we knew the time was right, and we released the lantern. And watched as the lantern moved slowly upward into the darkening sky. By this time, we had attracted a crowd. I wasn’t aware of them until I noticed the applause that accompanied our launch. I was so proud. My first launch was a complete success. And I looked back to watch my baby as it moved further up and away. That was when I realized our sky lantern was not heading out over Lake Michigan. To be honest, I knew the wind was blowing north, but I thought it would be shifting toward the north-west, which would have been fine. As I took in more of the surroundings than just the lantern, I realized 1) the lantern was not heading out toward the water, but instead was moving north-east, 2) there is a line of trees in that direction, 3) the trees marked the boundary of the Coast Guard Station, and 4) the wind about 10-20 feet above the ground was moving hard and fast toward the trees. My poor lantern had no chance. He struggled to gain altitude. But the wind held him down. The nasty wind drove our helpless lantern relentlessly on a direct collision course with the trees. There was never really any hope. Our lantern tried to move around the trees, but the wind pushed him this way and that, never waivering from its target. Suddenly, it looked as if the lantern might have out-maneuvered the wind, but then a tree branch reached out and grabbed the lantern and held it tight. My heart sank as I saw my little friend trapped and without hope. Meanwhile, the wind and the tree were busy giving each other high-fives in celebration. I knew the lantern was not happy at the ruination of its maiden and only voyage. Fire would be his answer. My thoughts were furiously trying to calculate the chances of the tree catching on fire. I stood there helplessly looking 50 feet up, waiting for the tree to burst into flame and the Coast Guard to come rushing out to save the day (and arrest the arsonist who had threatened their lives). Whichever god it is that watches over children and fools was also taking care of me that day. The fire sputtered and went out. The relief was palpable. You could feel it everywhere. No arrests would happen on this day. Something should have told me that was a bad idea, but it made so much sense. Being closer to the water would avoid the trees. It might even increase the chances of going straight north or even out over the water. It was a good plan, really. It turned out there was more wind down by the water, not less. But my group of accomplices were prepared, and they quickly got into the wind-blocking huddle formation, and we made fire again. Although there was more wind, it didn’t bother us because by now we were highly trained experts in the launch maneuver. Finally, we achieved lift off. But our poor lantern! 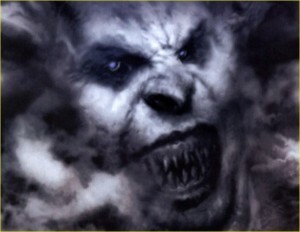 As soon as it got past our sheltering embrace, the evil wind was waiting. The same evil wind that destroyed the life of his brother. But this time, there were no trees. I smiled. We had outsmarted the wind. He was helpless to do anything except lift our lantern upward on his way to the stars. That was when I realized the wind had yet another trick up his sleeve. He didn’t have to let our lantern go up; he could make it go sideways. And he could do this for a very, very long time. 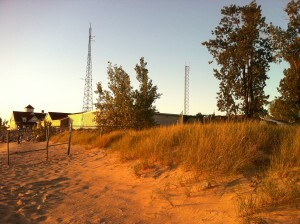 A quick calculation of the wind direction revealed that once again the Coast Guard Station was to be its target. But this time, it would not be a tree. This time, it would be the building itself that would burn. A Coast Guard tree going up in flames might be considered a foolish prank, but a second attempt on the same day would surely brand me as a terrorist. If only it hadn’t been a military installation the wind had chosen. How I hated him for this awful betrayal! But could I catch that runaway lantern? And somehow abort this impending disaster? I could see the wind had a 75 foot head start on me. But fear is a great motivator, and I burst into the fastest run I have done in years. I could see I was gaining on the lantern. Or maybe the wind was just toying with me. The wind seemed to pause. The lantern saw its chance and quickly rose 2-3 feet. I was overjoyed. If it rose at this rate, it might yet rise above the building and escape. I dared to hope. Still 50 feet away, I slowed my headlong rush. Suddenly, the lantern was pushed down again. It was now only 3-4 feet off the ground. And picking up speed. 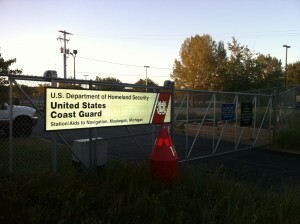 I saw the fence that surrounds the Coast Guard property. I desperately hoped the lantern would get caught by the fence. Maybe then it would not endanger the lives of the military people living there. Suddenly, the wind began lifting the lantern. That was when I realized the wind’s fiendish plan. The wind had hoped I would give up, thinking the fence would save me. The wind knew I would be stopped by the fence. He also knew he and the lantern could easily sail over it and go on to the building just a few feet away. I, however, would be powerless on this side of the fence, left with nothing to do but watch the building as it burned to the ground. I wondered if I could climb the fence. I also wondered if trespassing on a military base would be excused if I did it to put out a fire. Maybe. But a fire that I caused? Maybe not. Have I mentioned that fear is a great motivator? This time, I ignored everything except my need to catch that lantern before he cleared the fence. The quality of my remaining years hung in the balance. In an amazing burst of speed, I tackled the poor lantern just before the wind could lift it over the fence and out of my reach. It was close. I mercilessly killed the fire in our little lantern. There were strangers on the beach who had watched me speed past them. They watched me now, carefully avoiding eye contact, and clearly afraid to do or say anything that might draw the attention of the mad lantern murderer. As I dragged the broken body of our poor lantern back to my friends, I could feel their silent stares at my back. For some reason, my friends failed to understand the situation as I did. When I returned to them, still dragging the dead lantern behind me, I did not receive the accolades that were my due. Instead, I was greeted by laughter and ribbing about how fast I had taken off running. Did they not see my heroism and the ultimate sacrifice made by my little friend? Did they not understand the terrible peril that had been averted? Did they not picture me in a federal lockup somewhere? Steve, your story is great. It gave details of the location (although I can imagine it well), and had a wonderful storyline: Life was good, introduce stress, then suspense, and then my favorite… A happy ending!! If you give us some options (RSS or some other sign up), I’ll enjoy following you!! Good idea. I will look into it. The WordPress is a nice program, but there is a lot about it that is not intuitive (same with Joomla). Even if I found something once, it doesn’t mean I can find it again. I will look into it this weekend. Oh!!!!!!! Chuckles galore. Nice that the friends remained nameless. Wonder who those uncaring dolts were? 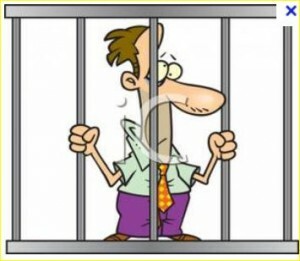 Perhaps it best,– save cell space at Federal prison. Would you have ratted out your accomplices? Oh, did you recall the truck parked in Coast Guard site with flashing light on top? It was the volunteer beach patrol. Probably primed for some odd duck playing with fire on the beach and some nutcase chasing around wrapped up in a table cloth like a SUPER HERO? A good time was had by all. And remember, Everything turns out ok in the end..if it isn’t ok, then it isn’t the end—So-o, try, try AGAIN!!!! Unfortunately, they only offer deals to underlings when they want them to rat out the main culprets. Since, by most accounts, I was the ringleader here, I doubt any deals will be offered. So my nameless friends are safe. For now.